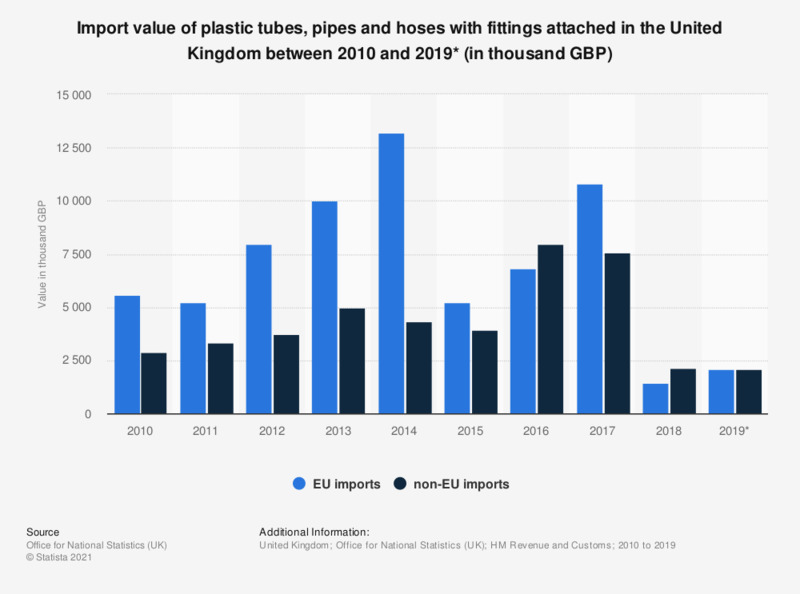 This statistic shows the value from EU and non-EU imports of plastic tubes, pipes and hoses with fittings attached in the United Kingdom between 2010 and 2017. The EU was an important trade partner for the United Kingdom over this period. EU imports of plastic tubes, pipes and hoses with fittings attached reached a value of eight million British pounds in 2012. Plastic tubes, pipes and hoses with fittings attached, excluding rigid - flexible tubes, pipes and hoses, with a minimum burst pressure of 27.6MPa - reinforced or otherwise combined with other materials.